The revolutionary commuter vehicle that combines the speed and agility of a motorcycle with the security and comfort of a high-performance sports car. The Tango's ability to maneuver through traffic is second to none. Like a motorcycle, it can change lanes to gain advantage in traffic better than any car in history. Unlike a motorcycle, it is safe, dry, climate controlled, and can securely carry a reasonable amount of cargo. Where lane splitting is permitted (i.e., driving between lanes of stopped or slow-moving traffic), such as California, Europe, and Asia, the advantage can be staggering. In extremely heavy traffic, a Tango or motorcycle can travel in 20 seconds the distance that cars travel in 20 minutes. 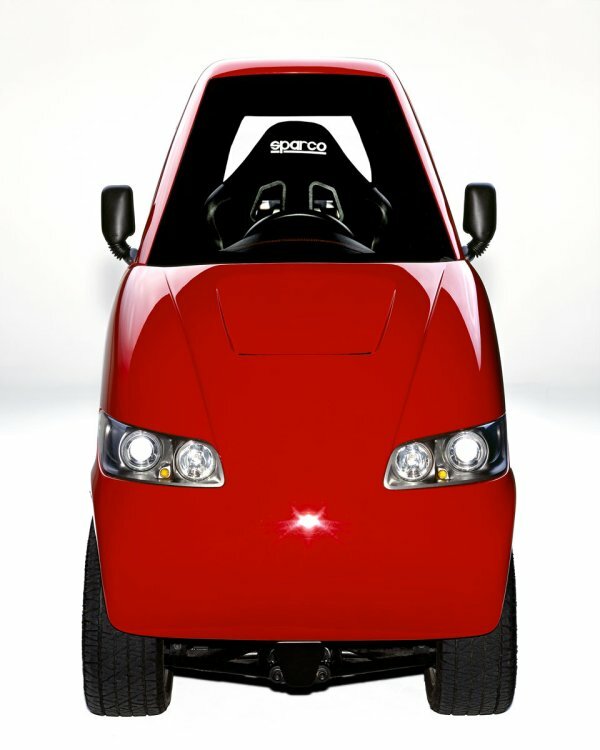 The Tango can fit in a 6-foot half-lane with more clearance than a truck has in a full 12-foot freeway lane. This virtual doubling of lane capacity can make the traffic jam a fading memory. A Tango can park perpendicular to the curb, in left-over spaces between cars or driveways, next to buildings, or in unused corners of parking lots--in thousands of heretofore-unusable parking spaces. The Tango's racecar-style roll cage design, its 4-point harnesses, its low center of gravity, and a weight comparable to a midsize sedan combine to make the Tango extremely safe. With 2,000 lbs. (mostly batteries) under the floor, the Tango's static rollover threshold is equivalent to a 5-star NHTSA rating, placing it in company with the lowest slung sports cars. With over 1,000 ft-lbs. of torque, the Tango can accelerate from zero to over 130 mph in one gear. Without needing an energy-robbing transmission or differential, it accelerates from zero to 60 mph in about 4 seconds and finishes the standing 1/4 mile in about 12 seconds at over 100 mph.